The new zero day exploit Of Internet Explorer has been discovered. By using this Exploit attacker can load malicious application on victim machines even on fully patched Windows XP SP3 as per Information IE 7 and IE 8 browser with Adobe's Flash software are Vulnerable to this Exploit. 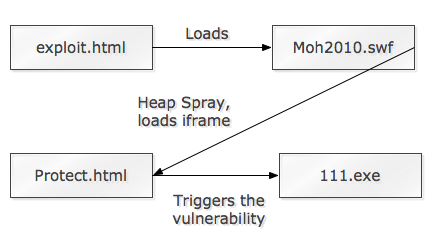 As shown in above image example, the file exploit.html creates the initial vector to exploit the vulnerability which further loads the flash file Moh2010.swf, which is encrypted using DoSWF. The Flash file is in charge of doing the heap spray. Then it loads Protect.html. Metasploit has released a working exploit for this Zero-day.